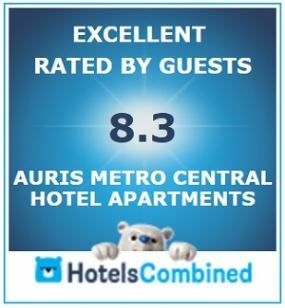 The First Group’s Metro Central Hotel Apartments, managed by Auris, is quickly gaining global recognition thanks to a string of prestigious accolades. Metro Central opened in Barsha Heights in March 2012, the thriving business district formerly known as TECOM, which is also home to our headquarters and three more of our hotel developments. Since then, this stylish 210 hotel apartment development has racked up a host of awards, the latest of which is a Recognition of Excellence by Hotels Combined. The website is a world leader in hotel searches and is used by over 300 million travellers each year. In order to be considered for the awards, hotel properties have to score 8.0 or over, have a minimum of 100 customer reviews on the site and be a winner of at least three awards throughout the year. Metro Central fulfilled all this criteria with a score of 8.3, and can now proudly display this badge on its website. No stranger to top accolades like this one, Metro Central was also awarded the 2014 and 2015 Certificate of Excellence by Trip Advisor website. In addition, it’s been listed as part of Booking.com’s Preferred Properties Programme, it holds a Certificate of Excellence by Hotels.com, and has received the 2014 Gold Circle Award by Agoda, which is based on a number of criteria, including customer reviews and competitive prices.